Chill-A-Bration’s has become an anticipated mid-winter attraction downtown. It attracts thousands of visitors Historic Downtown Cortland. 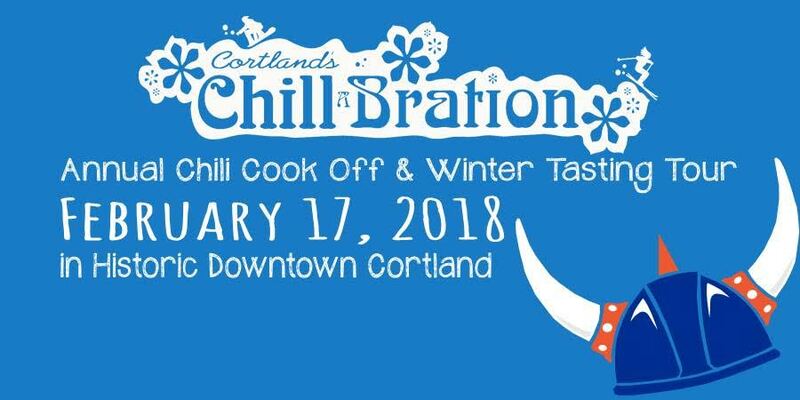 Running Noon to 4pm on Saturday, February 17, over 20 businesses will feature either a winter menu item to sample, or will prepare a special chili entry to compete for the title of “Cortland Area’s Best Chili” and “Favorite Winter Flavor”. Chill-A-Bration goers are encouraged to cast a ballot for their favorite samples by 4:30pm. There’s good incentive to vote, not only to support your favorite restaurants, but also, two ballots will be drawn for prizes. $15 ticket includes 20 tasting tickets, map and tasting guide, and ballot. (There is not a children’s packet, but note that ticket packets can be split and shared. Even those with the heartiest of appetites have trouble consuming more than 10 samples.) Proceeds from this event help support future Chill-A-Bration celebrations and allow Cortland Downtown Partnership to present family-friendly events that market the heart of our city, Historic Downtown Cortland. Check our facebook page for more info.